Musician, composer, professor, and conductor Fela Sowande was born May 1905 in Abeokuta, Nigeria. He was the son of Emmanuel Sowande, who was an Anglican priest and influential in the development of Nigerian sacred music. Fela Sowande was a musician and composer of music in the classical European style. Sowande studied at CMS Grammar School and King’s College, Lagos and received his Fellowship Diploma (FRCO) from the Royal College of Organists in Lagos. He also worked as a band leader and was heavily influenced by jazz and popular music as well as the church music of his father and mentor. After moving to London, UK in 1934, Sowande received his Bachelor of Music degree from the University of London and became a Fellow of Trinity College of Music. In Britain, Sowande worked as a church organist, a theatre organist, a dance pianist, bandleader, and choirmaster. 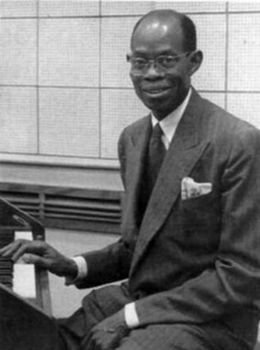 His organ music compositions were based on Nigerian melodies which had great resonance with the growing population of African and Caribbean immigrants to Great Britain. Sowande was a highly prolific composer in a variety of genres: organ, choral, solo, and orchestral works as well as an author of four books. He composed music for the British Ministry of Information during World War II. After the War he worked for the BBC Africa Service and then in 1953 moved back to Nigeria to work for the Nigerian Broadcasting Corporation. Sowande’s academic record was as geographically wide-ranging as his research interests in African music. He received a United States State Department Leaders and Specialists grant which afforded him the opportunity in 1957 to present organ recitals in New York, Boston, Massachusetts, and Chicago, Illinois, and to lecture on his research. The Rockefeller Foundation later sponsored his work in New York. He was a visiting scholar at Northwestern University’s anthropology department for the academic year 1961-1962 and he later studied composition at Princeton University. Sowande received a grant from the Ford Foundation (1962-1965) to conduct research on Yoruba religion. In 1966 he was awarded a Nigerian government grant to study and write about Nigerian music. He was a research fellow at the University of Ibadan, Nigeria from 1965 to 1968. Fela Sowande moved permanently to the United States in 1968, taking an academic position first at Howard University, Washington, D.C. until 1972, then took a position at the University of Pittsburgh (Pennsylvania) until 1976. His last academic position was at Kent State University in Ohio, from 1976, where he remained with his wife Eleanor McKinney, until his retirement in 1982. He died in 1987 in Ravenna, Ohio from complications associated with a stroke. AfriClassical.com African Heritage in Classical Music, http://chevalierdesaintgeorges.homestead.com/sowande.html; Godwin Simeon Sadoh, “The Organ Works of Fela Sowande: A Nigerian Organist-Composer,” http://etd.lsu.edu/docs/available/etd-02212004-111053/unrestricted/Sadoh_dis.pdf; Doiminique-René De Lerma, “African Heritage Symphonic Series,” in De Lerma, “The music of the Black composer,” http://www.africanchorus.org/Artists/Sowande.htm.